fall is here and it makes me crave all sorts of soups. 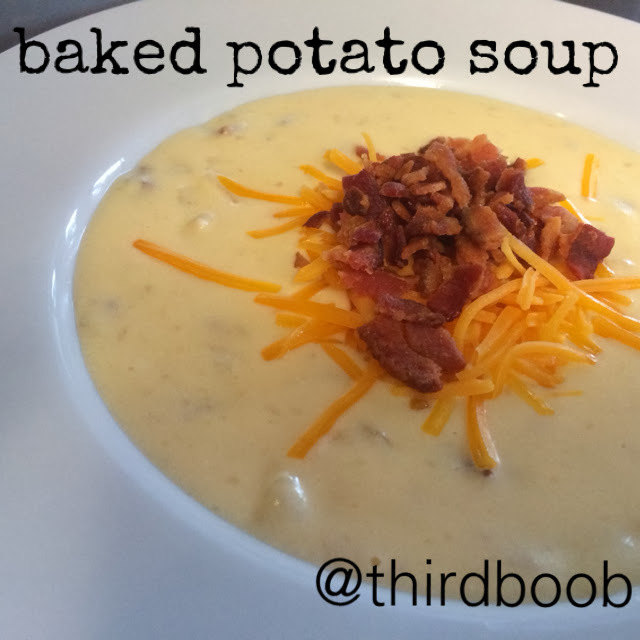 baked potato soup is my all time favorite fall recipe. it reminds me of comfort, of good times with college roomies....and it once even played a *tiny* role in a successful matchmaking/blind date of two of my friends that resulted in a 9 year marriage and 4 kids. truth. you can even make this recipe gluten free easily by using gluten free flour. easy peasy. (add more or less bacon, cheese or sour cream to your liking). in a large soup kettle or pot, melt butter. stir in flour and heat and stir until smooth and blended. gradually add milk, stirring constantly with a wire whisk until thickened. add potatoes. bring to a boil, stirring constantly. reduce heat and simmer for 10 minutes. add remaining ingredients and stir until cheese is melted. top with extra crumbled bacon, cheese and green onions, if you want to get all fancy!